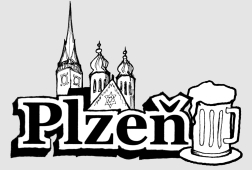 As the second largest city in Bohemia and with a location halfway between Prague and Munich, Plzeň is an easy place to visit by public or private transport. From Prague by bus there are two companies that carry passengers the 80km to Plzeň at least a dozen times each day. Student Agency buses depart from Prague's Zličín Metro station hourly, taking around an hour to complete the trip. The fare (approx 95Kč, and you'll need probably a 26Kč metro ticket to get out to Zličín) is slightly higher than regular buses, but hot drinks are served on board for free and the quality and comfort of the vehicles are higher. ČSAD buses depart from Prague's central Florenc bus station and take from 1 hour to 1 hour and 35mins depending on the particular departure and how many stops it will be making along the way (fare approx 90Kč). From Prague the trains follow a more roundabout route than the buses and take 1hr 45 mins to reach Plzeň's main station. (fare 147Kč full price, 111Kč with group discount). From Munich, Student Agency buses are the fastest, cheapest and most comfortable way to travel. They pick up passengers at the bus station (Fröttmaning, st. 18 ) and the airport (Terminal 2, E03, st. 22) in less than 4 hours. The full fare is 850Kč, but discounts are available (youth, 30 day advance purchase etc) which may reduce it to as little as 550Kč. Trains from Munich take at least 4 hours, may involve transferring and will cost around 1250Kč. From Český Krumlov by bus or train requires a change at České Budějovice. The best connections take about three hours to cover the 162 km and involve taking a bus from Český Krumlov to České Budějovice and a train on to Plzeň from there. 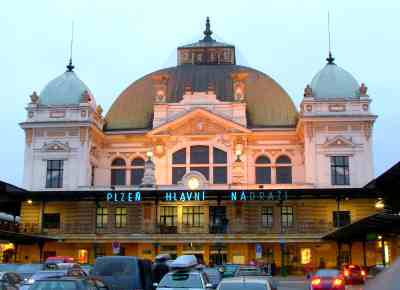 From Karlovy Vary, frequent direct buses take around 90 minutes to cover the 84km to Plzeň for about 85Kč. It's also possible to make the journey by train, but they follow a slow and indirect route and are more expensive. From Telč, the journey to Plzeň requires a change in České Budějovice. Bus is best from Telč to Budějovice and the trains and buses are equally as good for the Budějovice to Plzeň leg of the trip. From Olomouc and Kutná Hora, it's best to make your way to Prague and follow the above directions from there.